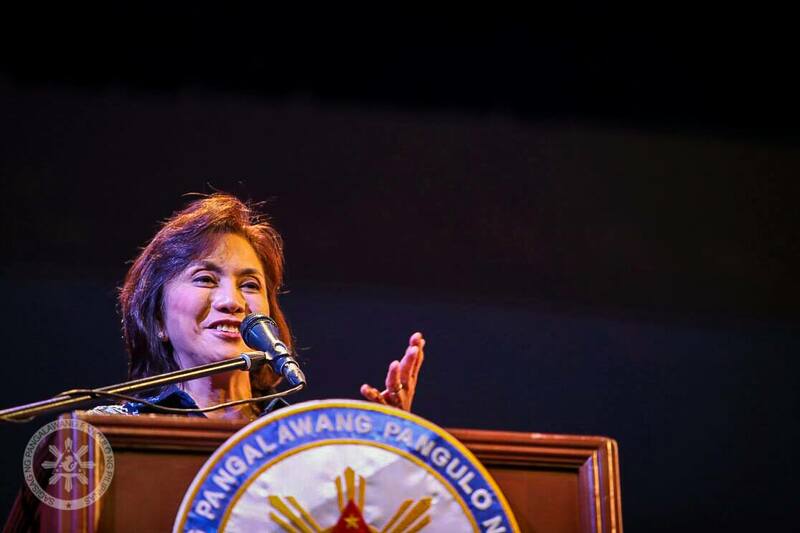 Thinking Pinoy: Robredo's "Army of Truth" vs Sen. Alan Peter Cayetano? In “Is Sen. Alan Peter Cayetano a PH citizen?”, the Philippine Daily Inquirer’s Rodel Rodis, a US-based immigration attorney, cast aspersions on Senator Alan Peter Cayetano by questioning his citizenship. Rodis prefaced his story by mentioning a Wikipedia article listing “former United States citizens who relinquished their nationality”, a list that contains Alan Peter Cayetano. Yes, a lawyer-journalist citing Wikipedia. Yes, I know. Yes. Rodis also claimed that the results of Cayetano’s 2007 citizenship case lodged at the Comelec is unknown. Rodis rambled throughout the article, even citing the presidential candidate Sen. Grace Poe’s COMELEC Case and also Yasay’s tiff with the Commission on Appointments. He went on and on without even consulting Cayetano… or even Google. A quick Google search shows that Comelec junked Capco’s case in 2007. Speaking on behalf of the Comelec en banc, then-Chairman Benjamin Abalos said, “We’ve finally decided to put an end to the citizenship issue of Congressman Cayetano affirming the resolution of the second division, meaning he is a natural-born Filipino. [GMA]"
At this point, I think it’s pretty clear that the issue has been settled. Capco’s choice not to raise the issue to the Supreme Court is Capco’s problem, not Cayetano’s. I will not argue anymore about Cayetano’s citizenship as I believe that Cayetano has clearly explained it in a statement published several hours after the Inquirer article’s release [Cayetano]. What’s more interesting, I believe, is what happened behind the scenes. Any self-respecting journalist, let alone a lawyer-journalist, refrains from citing Wikipedia as a source for the simple reason that Wikipedia is prone to “disruptive editing”. For example, a Wikipedia article you’ve read just now can be totally different from the same Wikipedia article you’ll read tomorrow. And disruptive editing – if not outright vandalism— is what exactly happened to the page that Rodis cited. Let me explain that in a bit. Here’s where it gets really fun! To help guard against disruptive editing, each Wikipedia article has a “View History” tab, which allows readers to check the article’s edit history, and that’s what I did to the Wikipedia article “List of former United States citizens who relinquished their nationality”. Was the article edited recently? The timestamps on each Wikipedia edit use the UTC+0 time zone. Meanwhile, Inquirer uses Manila’s time zone (UTC+8). UTC+8 is 8 hours ahead of UTC+0, so that Rodis’ Inquirer article,which was published at 1:21 AM of 16 March 2017 (UTC+8), was published at 1721 hrs (5:21 PM) of 15 March 2017 (UTC+0). The latest edit is by RMS125A, a Wikipedia moderator, so there should be nothing fishy about that. What’s interesting, instead, are the next two edits by a certain “202.78.90.129”. You can edit Wikipedia articles without logging into an account. However, the system uses logs your IP address and shows it as your username. Clearly, those two edits were done by an amateur. The first edit, shown below, was at 2030 hrs of March 15, where “Alan Peter Cayetano” was replaced with “Ebenezer Ramos Bonbon”. It appears that this was a typo error on the Amateur editor’s part, as he immediately edited it three minutes later. The second edit was at 2033 hrs of March 15. This edit was much more extensive, as the editor virtually deleted everything about Cayetano, including all the reference links.Now, why would someone delete the write-up about Cayetano? Based on the time stamps, both edits were performed about 5 hours AFTER the publication of Rodis' Inquirer article. A closer look at the deleted sections show that one of the references cited is a GMA News article indicating that the Comelec junked the case filed by Capco against Cayetano. Yes, that amateur editor, whoever he is, tried to save Rodis’ article, because leaving the Wikipedia article as it is would make Rodis’ Inquirer article fall flat on its face. Yes, the amateur editor really needed to delete the reference links because the same Wikipedia article that Rodis cited would have been enough to debunk Rodis' own article. But wait! How could something as simple as that slip Atty. Rodis’ eye? Judging from reviews written by his former clients, Rodis is a crappy lawyer. Rodis' Avvo reviews indicate that he's "unprofessional", "awful", a "nightmare" and "just horrible" [Avvo]. Avvo is an online legal marketplace where users can post reviews of their experiences with lawyers. "Rodel Rodis represented my family in a trust dispute, and came across as unprofessional in his correspondence, and significantly incredibly unknowledgeable regarding trust laws and litigation. He was embarrassing in his representation." Is this the same reason why Rodis reportedly closed down his San Francisco offices [Yelp]? That is, he got so many negative Yelp reviews that he either (1) closed his Yelp page or (2) closed down his San Francisco office altogether? I tried to geolocate 202.78.90.129 and the online tool [IPLocation] yielded a (latitude, longitude) pair of (14.6627, 121.0328) which, in turn, translates to somewhere in Project 6, Quezon City [LatLong]. Internet service providers in the Philippines typically use dynamic IP addresses, so that a connected computer’s IP address may change over time. However, it would be safe to say that that that amateur editor was located somewhere in Northern Metro Manila when he edited the Wikipedia article. So we have our first clue: he’s somewhere north of Metro Manila. 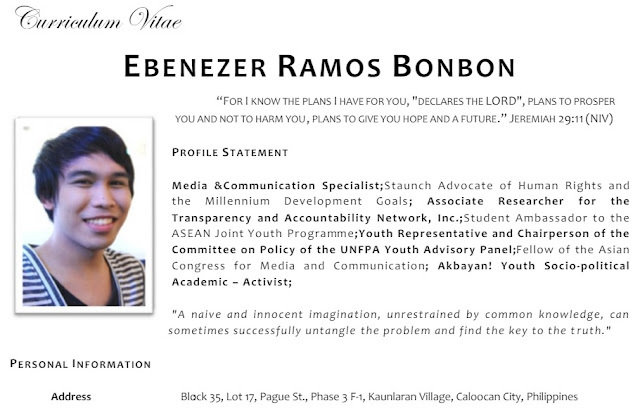 Now, a quick google search using “Ebenezer Ramos Bonbon CV” yields, well, the CV we’re looking for [Scribd]. In particular, I found out that based on his 2011 CV, Mr. Bonbon lived in Northern Metro Manila. A closer look at the CV shows that Bonbon is closely affiliated with Akbayan Youth. Bonbon must be very close to Akbayan because he even chose Akbayan Youth’s then international secretary, Prof. Adonis Elumbre, as a character reference. Based on these data, I have a reasonable suspicion that the amateur editor is actually Mr. Bonbon. After all, electronic data security is not the opposition’s strongest suit, as shown in #LeniLeaks, where LP-aligned Global Filipino Diaspora Council were so careless that they unwittingly made their confidential email conversations available for public consumption. Yes, it’s Akbayan, the same political party with strong links with VP Leni Robredo’s Liberal Party. Senator Risa Hontiveros, an LP stalwart, is from Akbayan. The same goes with UP Professor Sylvia Claudio, the Rapplerette who penned the satirical article “10 Reasons I’m now a Dutertian”. Yes, Akbayan and LP are practically the same. Yes, it appears that an Akbayan member may have tried to cover up Rodis’ blunder to keep Rodis’ poorly-written and poorly-researched article viable for a longer period. Is it really Bonbon who edited the article and if so, is he a part of Robredo’s “Army of Truth”? For one, Rodis is part of the Diaspora Council, so that makes him part of Robredo's international propaganda machine, so does Ebenezer Bonbon work under Pete Silva?